At Riverheart Family Dentistry, we make even our youngest patients feel comfortable and confident when it comes to going to the dentist. Dr. Schwarz is a gentle and skilled dentist who understands the importance of providing a positive dental experience for children so that they develop disciplined dental care habits as they grow. Our office provides a wide range of general, restorative and cosmetic dental services for patients of all ages, which means we can treat your entire family in one convenient location. Children's teeth are more prone to decay for many reasons. We help them understand the importance of proper brushing and flossing and explain the eating habits that could damage their smile. At Riverheart Family Dentistry, you can trust that we will do our part to keep your child's smile healthy and protected, from routine cleanings and digital x-rays to dental sealants and custom athletic mouthguards. If your child does have a dental problem, such as a cavity or chipped tooth, Dr. Schwarz will use a conservative and gentle approach to restore his or her smile to optimal function and aesthetics. It is our goal to provide an environment that is inviting and positive for your child. We accomplish this in many ways, from providing a children's play area in the lobby to letting your child watch cartoons during their treatments and pick out a prize at the end of the visit. 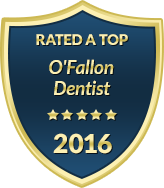 We have a knowledgeable staff who does their best to make going to the dentist a fun experience for kids. To help eliminate your child's anxiety or fears, you can trust us to always use kid-friendly language when explaining a dental treatment or upcoming procedure. When needed, we also offer nitrous oxide to safely and effectively relax your child during while in the dental chair. At Riverheart Family Dentistry, we value your need for convenience. We proudly offer extended weekday hours as well as family block appointments. Our office accepts most dental insurance carriers and we have flexible payment options to respect your budget needs. Contact us today to schedule a pediatric dental appointment in O'Fallon. From the moment you walk in our doors, you will discover how much we love caring for your child's smile!